CAPTURED: Wadden Sea, Netherlands, 23 June 2010 (by Dolfinarium Harderwijk, utilizing the patrol vessel “de Krukel” of the Dutch Ministry of Agriculture, Nature and Food Quality. TRANSFERRED: From Dolfinarium Harderwijk to Loro Parque tanks on 29 November 2011. Cetacean (whale, dolphin, porpoise) captivity transport methods were used; a crane to load Morgan into a container, then she was then trucked to and loaded onto a plane (still inside the container), then upon landing on the island of Tenerife, Morgan was transferred to another truck and then finally craned out of the container and into the tank at Loro Parque. 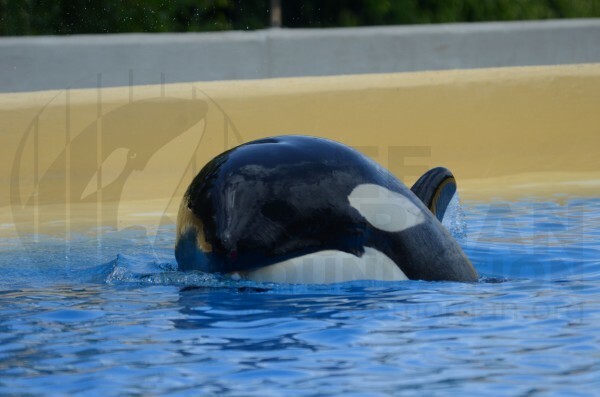 A video of Morgan at Dolfinarium Harderwijk shows her being removed from the tank and into the container. SIZE: Morgan is a young female orca from Norwegian stock and as such she could reach over 7m (Christensen, 1984). The sizes of Morgan, given in Table 1 below, were provided by the aquariums that have held Morgan. We provide the source of the information but do not vouch for its accuracy as there are clearly discrepancies between various reports of her size (see notes below Table 1 for details). Of note is that Morgan was, by 2012, already longer than the tiny Medical Tank at Loro Parque, is deep. The measurements of the Medical Tank are; 4.2 (deep) x 7.1 x 12.4 m long and wide, respectively. The tank is less than 2x her length, at its widest. NOTE: There are some very real discrepancies with regards to the data supplied by the captivity industry, particularly in relation to Morgan’s size. Try to reconcile the following facts regarding annual orca growth (where n = is the sample size in the scientific paper) and Morgan’s growth rate, ascertained from the table above. Therefore, Morgan was growing SLOWLY (22 cm in one year) or phenomenally FAST (41 cm in just 3 months). AGE: On the 20th of November 2013 the veterinarian Dr Greenwood, who works very closely with the captive cetacean industry, stated that Morgan was now “Estimated to be 5-6 years old, base on size and appearance at the time of rescue, and the onset of ovarian cyclic activity very recently. Retrospectively she is considered to have been small for her age at rescue.” This assessment (that in 2013 she was 5 or 6 years old in November 2013), would make her year of birth as 2008 or 2007, which we had always maintained. The same data that we used (the length of known age animals) has always been available to the captivity industry (we present it in the Table below). In fact the captivity industry has a lot more of this type of data than they ever publish, ,despite their claims to publish extensively. Niels van Elk, the veterinarian at Dolfinarium Harderwijk, claimed that Morgan was only 18 months old at capture (rather than the ‘at least 3 years old, probably 4 years old and possibly even 5 years old’ that the Free Morgan Foundation had calculated). We presented the data in on Morgan’s length, compared to orca of known length and known-age (or estimated-age) in Court, yet despite this evidence, which clearly showed Morgan was at least 3 years of age, probably 4 years old and possibly even 5 years old, the Dolfinarium Harderwijk maintained that Morgan was 18 months old. Furthermore, they also falsely stated in their application for a CITES permit to transport Morgan that she was only 18 months old. This shows again the duplicitous manipulation of the data by the industry and it is clear that the Greenwood letter (presented in Court) was trying to mask the fact that Morgan would have been old enough to be considered for rehabilitation (i.e., she was able to feed herself, despite what they claimed). Captive orca typically have an ovarian cycle of 6-7 weeks in duration, according to data published about orca held captive at SeaWorld. Duffield et al (1995) state that gestation of an orca is, on average, 17 months. However, Robeck et al (2004) state it is approximately 18 months.